Located among the vineyards of a historic Chianti Classico farm, the farmhouse is only 10 minutes from the well-known town of Greve in Chianti, 20 minutes from Florence and 50 from Siena. In addition to offering peace and relaxation, it is the ideal place to discover the countless medieval villages, jewels of the Tuscan countryside of the Florentine province and the cities of art. The house is independent and for the exclusive use of a single group or family. It has a large swimming pool (13 x 7 meters) for the exclusive use of the guests of the house and is surrounded by a fenced garden of over 8000 square meters, also ideal for families with children. Here, centuries-old walnuts and a loggia overlooking the pool offer an atmosphere of absolute relaxation and refreshment even during the hot and sunny hours. 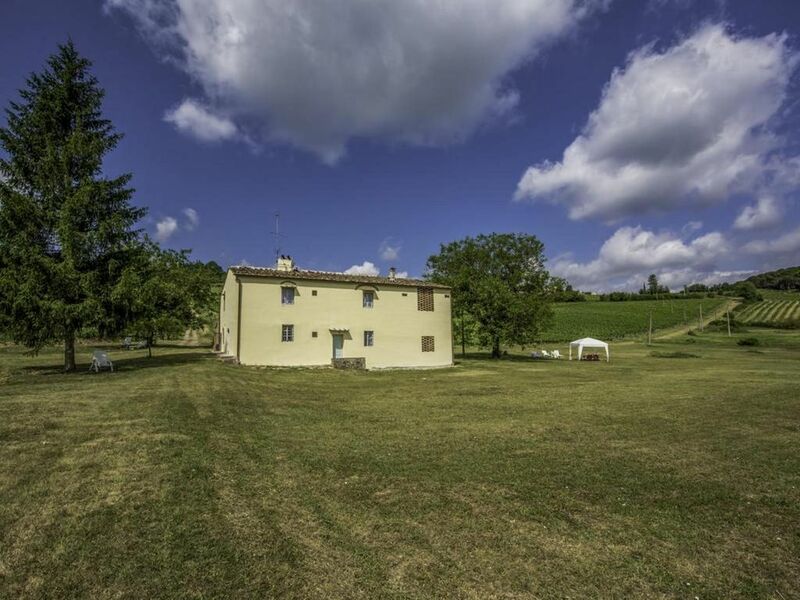 This farmhouse is recommended for those who like exclusivity and privacy, relaxing in the nature of the marvelous Tuscan countryside and those who want to comfortably visit the Chianti and the nearby cities of Florence and Siena. The villa is located just 20 minutes by car from the center of Florence and about 10 minutes from Greve in Chianti. The village of Impruneta is just 5 km from the farmhouse. The property is surrounded by a further 8 hectares of prairie and 20 hectares of Chianti classico vineyard in production. The farmhouse (PODERE GREVE) of over 120 square meters, which enjoys a fantastic view over the vineyards, consists of 5 large rooms and can comfortably accommodate 6 people: on the ground floor there is an independent kitchen with a fireplace and a dining / living room , equipped with satellite TV. On the first floor there are 3 large and elegant bedrooms, two of which double and a double room that can be transformed into another double bedroom and bathroom. Large external loggia and courtyard for your breakfasts, lunches or dinners in the open air, or simply to sip an aperitif at sunset seduced by the surrounding countryside. The villa is exclusively rented to a single group of people, one or two families or a group of friends who will have the entire complex at their complete disposal: private and independent villa, park and pool. Great location for visiting Florence. The farmhouse is rustic with basic facilities. Unfortunately we couldn't rate it any higher because the pool area was unfinished and the house not as clean as we would have hoped. The pictures do not do this place justice. The scenery is amazing and the new pool is a real asset! If you want some quality time away from it all,then this is the place. Lovely traditional farmhouse, set within acres of private vinyards. Great, large private swimming pool. Great covered terrace and shade from trees when its just too hot. Mosquito's. Its a problem all over this part of italy, but prepare to get bitten.. alot. There are two roads in, the longer route which the satnav took us on when we first arrived was little more than a rough track. I mean rough. The shorter rough is better, but still pretty bumpy. The heat... There is no air con, but the fans provided in the bedrooms do provide some relief. We are very happy that your stay in the farm "Podere Greve - Chianti" farm It was great! A greeting at soon from Chiantishire! We stayed here with family for a very special occasion. difficult to find better for an exclusive villa / country house just for us.!! We are really pleased for the nice words expressed in the feedback about Podere Greve - Chianti! Thanks Nicholas to you and your beautiful family. ho soggiornato i primi di settembre insieme alla mia famiglia in questa meravigliosa casa colonica circondata dai vigneti del Chianti. La casa è molto confortevole con le sue camere grandi ed eleganti. Nonostante il caldo estivo la casa è fresca e arieggiata e non c'è necessità del condizionatore. La piscina é molto bella. Il Podere é vicino alla città di Firenze e anche i paesi del Chianti si raggiungono molto velocemente. Io e la mia famiglia siamo rimasti felici del soggiorno anche perché é difficile trovare ville indipendenti a nostro esclusivo uso con queste qualità. We were 3 families traveling together and did a lot of research to find the right villa and location - but' its hard to tell from pictures what you're getting. I must say PODERE GREVE could not have been a better choice. The villa was all at our disposal. There was plenty room for all of us. We loved the decor, simple and comfortable. The garden is immense and the view of the vineyards is fantastic. The pool is very large. Perfectly located to visit Siena, Florence, lots of wineries and all the lovely villages around Chianti. What a great memory. We highly recommend this spectacular villa! Gentile e buona accoglienza, posto rilassante per chi cerca tranquillità e natura. Ampio spazio esterno per i bambini .